‘’The first international my dad brought me to was Ireland against the All Blacks in December 1963, that was probably the single most defining day of my life. ’To be at Lansdowne Road, I actually remember the exact area I was located, it was near the halfway line on the West Upper and I can remember it as if it was yesterday.’’ ‘’I remember the Irish team coming out and then the huge Australian giants following them on after.’’ He had another hero, Colin Meads who was nicknamed ‘Pine Tree’, that he watched perform that day, ironically, 20 years later he actually managed to meet him later on, on a Lions Tour. 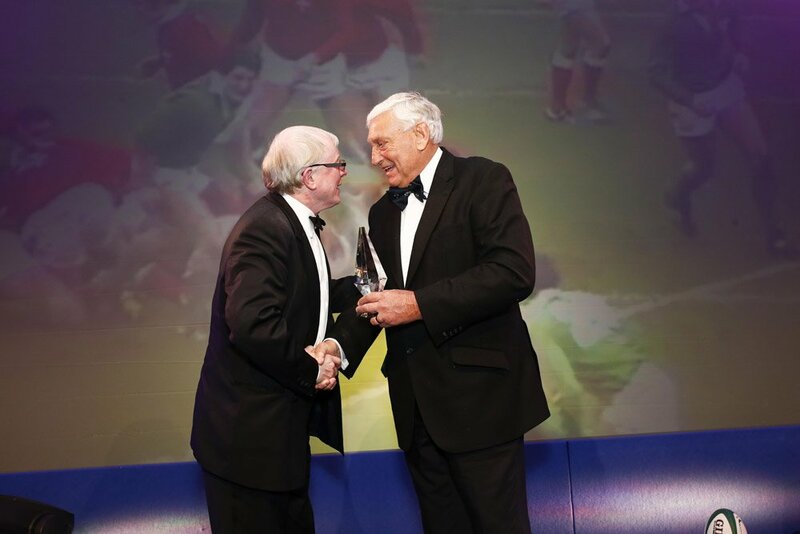 ‘’Colin Meads was the first New Zealand player I met on the tour.’’ ‘’I was very happy as I actually had a huge interest in the New Zealand team and the way they played. Ollie got his first cap against Australia in Lansdowne Road in January ‘76. He was 21 years old and 11 stone. ‘’I looked like a mascot rather than a player!’’ It was the only team that he was dropped from in his 21-year playing career. ‘’At the time the worst thing that ever happened to me. In retrospect, it was the best thing. The Lions stand for everything that is good in rugby – and I was blessed to go on two Lions tours, to South Africa in ‘80 and New Zealand in ‘83. Though ultimately unsuccessful they were experiences of a lifetime – and unlike current tours, they lasted 3 months! 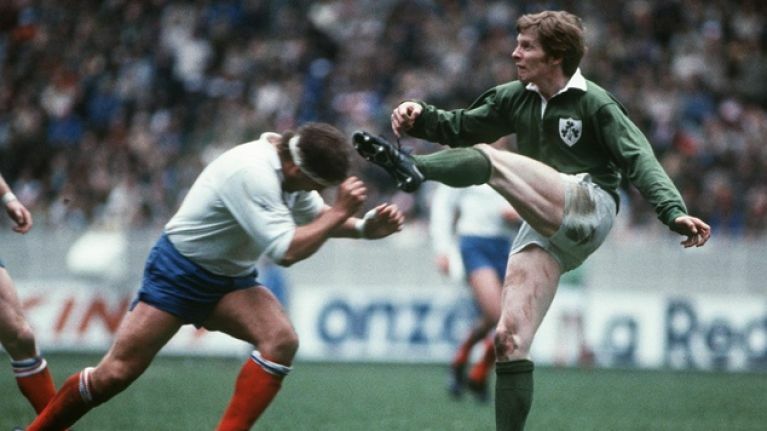 Previous tours even lasted 4 and 5 months!’’ Ollie Campbell’s career blossomed after the 1979 tour, Ollie simply sums up everything that was great about Irish rugby back in the early 80’s. Ollie stated that he had many fond moments of playing rugby, the fact that he was on 2 winning school cup teams in Belvedere meant the world to him. The 1979 Ireland rugby union tour of Australia was a series of eight matches played by the Ireland national rugby union team in Australia in May and June 1979 was one of his personal favourites. The tour was one of Ireland’s most successful to date. Ireland won seven of the eight matches they played, including both tests against Australia. The only defeat came against Sydney. Joe Schmidt’s current Ireland team are ranked second in the world. However, Irish rugby wasn’t always in such a healthy state. On 20th February 1982, Ollie Campbell kicked all 21 points in a 21-12 victory over Scotland at Lansdowne Road to secure Ireland’s first Triple Crown since 1949. Ireland’s amateur, 32-county team provided hope in a dark time, as told by the players. Tony O’Reilly, the former international rugby union player, a man that still remains close to Ollie once stated ‘‘Rugby is a template of life’’. This quote really stood out to Ollie as rugby taught him and many of his teammates about dealing with the ups and downs of life. ‘‘Rugby teaches you about the triumph and disasters.’’ To these players rugby was really their template of life, it was the way they were brought up and it was their entire lifestyle. ‘’For me, rugby was what I really looked forward to, it was the highlight of my Belvedere days.’’ Ollie reminisced about his playing days. ‘’Rugby should be fun and an adventure – and that’s exactly what rugby was for me!’’ So there you have it, the sport may have changed drastically but I would have to agree with Ollie you’ve got to embrace the journey and adventure that comes with it as well.